As the season draws to a close and we reach the middle of October, it was another great day for sailing – dry with sunny spells and lots of strong wind. Nine WS Racers and two volunteer helms arrived at Chipstead well wrapped up and eager to make the most of these great conditions and to eke out an improvement of their individual lowest score in the Summer Series. Ann, Bob, Steve, David M and Malcolm H were notable absentees from the day’s proceedings for a variety of reasons (Ed, Hope to see you all in the final two races). After 9 Races (#4 having been cancelled) there were just 3 more to go and that means everyone – even the leading group – can shave one or more places off their “Five Lowest” results. With a 12 to 15 knot wind prevailing from the East, the same course as the last race was set; so the sailors assembled at the West end of the lake close to Mark A and after the Start (at 11.30 for the Double-handed Hansa 303s) they had a tough beat across the lake to Mark D and after leaving it on the port hand they had an exciting run downwind with a gybe around Mark C and more running down to round Mark A, to complete the lap. After last week’s very tough sailing conditions, those Racers who turned up probably found it not only a pleasure but also slightly more relaxing to be out on the water. The wind blew more consistently even though there were still the usual Chipstead gusts to keep the Racers on their toes (or tipping them onto their gunwales) and I could see the Helms having to contend with some significant wind shifts as they beat their way back to windward after completing each lap by rounding the windward Mark A. The comments made about the inaudibility of the starting whistle and shouted clarifications for last week’s Race were understandable. The wind conditions were not so bad this week (and hence less noise from all the sails and the water) and we hope everyone knew where they were in their individual start sequence. We know that some Racers have their own countdown watches and they are able to get the best boat position in the last 30 seconds before their Start. (Ed. 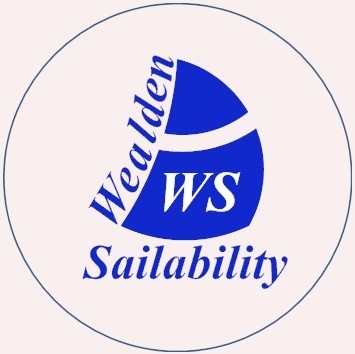 For those that rely on hearing the whistle and shouted instructions we can only suggest that if you are unsure, sail by the Race Boat and ask). 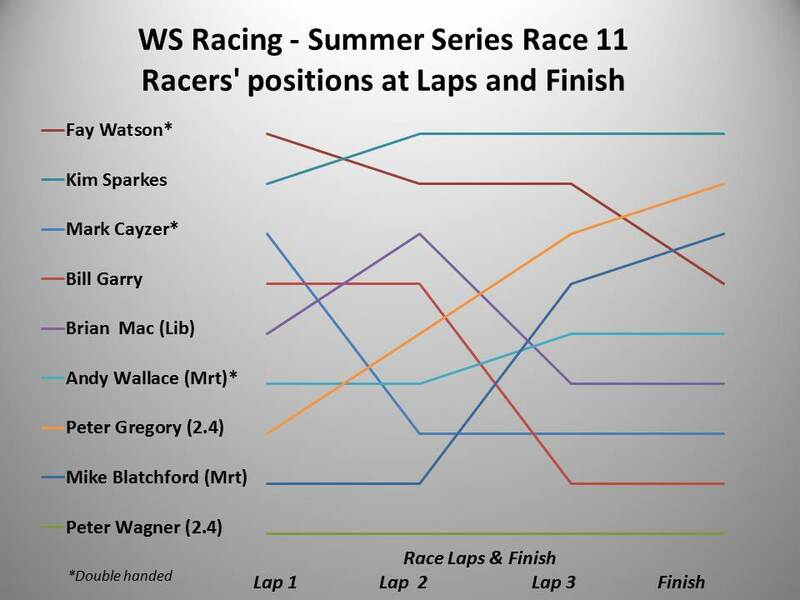 This week’s Start saw Mark Cayzer/Mike getting away just ahead of Fay Watson/James but they were both still quite tentative and didn’t get across the line for 15 seconds! Bill Garry followed them up the lake just before Kim Sparkes crossed the line in her 303 just as her Start whistle sounded – a minute after the double-handed 303s, and she immediately started to chase after the leaders and get as far away from the 2.4s and Martins as possible! Unusually for him, Brian Mac was some way off the Start line just as the starter’s whistle was about the blast but he still managed to find some wind and get his race underway in his Liberty just over 2 minutes after the single-handed 303s! Then a full 8 minutes later, the remaining entrants, two Martins and two 2.4s, were released into the fray. But not without incident (Ed. Apparently . Since I later heard at lunch outside the clubhouse that a seemingly valid protest might have been made as a result of a large Martin baulking a small 2.4 in the final 5 seconds before the Start!!) The only recall the Starter had was of Andy Wallace /Bob having an absolute flyer of a start, crossing the line as the whistle sounded, and a glimpse of Mike Blatchford closing in on the far end of the Start line at speed but not being able to complete the manoeuvre because he would otherwise have crossed the Line too early. So he bailed out and had to do a 360 turn to be able to start his race. The Race developed as the schematic below shows. Fay sailed very well throughout but Kim managed to get to the front of the fleet just as lap 2 was starting and, whilst Fay’s and Mark’s 303s and even Brian’s Liberty were gradually overhauled (as the handicapping system predicts) by Peter Gregory in his 2.4 and Mike Blatchford in his Martin, Kim managed to hold the lead right through the full 40 Minutes. Peter W in his 2.4 made a very good start to the race but soon had boat problems and had to visit the pit lane for some running repairs, after which he just couldn’t make up the lost ground – but seemed to enjoy himself nevertheless. (Ed. Did I see Mr Wagner out sailing in a Liberty in the afternoon session?) And as Peter G said to me after the Race – “In today’s conditions, when you’ve got helms who know how to sail well, the handicap system works!” I heard a number of helms say – if only the race had finished 2 minutes earlier, I would have been 2 places higher up the leader board!! That’s the essence of Pursuit Racing – and it means that the early starters have got to keep their concentration up and just keep sailing as hard as they can. Well done to everyone who had another excellent day on the water at Chipstead. Final Result: 1. Kim; 2. Peter G; 3. Mike B; 4. Fay/James; 5. Andy/Bob; 6. Brian Mac; 7. Mark/Mike; 8. Bill Garry; 9. Peter W.
The information in the schematic and the results exclude the two volunteers’ progress and finishing positions. Yes, I had some rigging issues where the sheets came completely away from the jib. It was so annoying, as I was doing quite well up until that point. I think the problem occurs when it gets caught up with the rope which is bound to the mast. Quite simply, there is soo much rope in the 2.4s, but nowhere to put it. On whole a challenging race though! Apologies for not joining the fray yesterday, still suffering with a wheezy chest. Mr Farmer also had another appointment elsewhere. It’s only fair to advise people at this stage that I have also been employed by MI5. In a covert operation looking for an undercover agent code name ,’the tall handsome Irishman’ . Several suspects have been investigated and cleared including one of the trustees who obviously has a fake Irish accent. We have utilised Voice Recognition technology VRT which identifies an overriding French accent. Our enquiries continue. It is clear that the introduction of random testing has had an effect…no Farmer,Fisher or the man with the white hair. But the Blonde in the Reeds is still playing the game of turning up at the last moment pretending that it was all Pippa’s fault that she was late aqnd therefore no time to take the test.One day she will have a big surprise.The young Wagner had his new wet gear on this week but never had a chance to test it claiming that his rig had been sabotaged…but by whom?james and Fay were reunited and looked as if they were never apart..But what to do with BillG…proping up the bottom as Andy and Bob steamed ahead.And BobMac at last concentrated on sailing with no stops for morning tea and biscuits.Ahhh…the joys of racing when fairness and sportsmanship rule the day.And it was good to welcome the Thomas back from the Costa del Sol looking tanned and groomed. happy days…. In compensation, and explanation, he failed, after many attempts, to push this “plonker” in but I was almost able to make him drink some of the lake and certainly wash his feet – so I’d say, good result alk round! Well done Mark, let’s hope for better luck next time.